California officials have decided to add the gray wolf to the state's endangered species list. At a meeting Wednesday, the state's Fish and Game Commission voted 3-1 in favor of the listing, which will keep the animal safe from hunters' crosshairs. The decision requires a second vote in August to become final. Cattle ranchers opposed to endangered or threatened status say the wolf is a threat to valuable herds. Environmentalists argue there are places where wolves and livestock exist together. "We are very concerned about listing the wolf under the California Endangered Species Act," said Justin Oldfield, vice president of governmental relationships for the California Cattlemen's Association, prior to Wednesday decision. 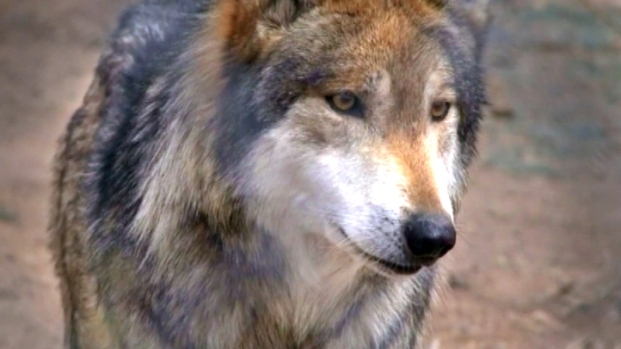 Once considered extinct in the U.S. the Mexican Gray Wolf is making a comeback. KPNX-TV's Trisha Hendricks reports. Amaroq Weiss of the Center for Biological Diversity, which leads the push for protection, said there are places where wolves and livestock exist together. "There are definitely avenues for not only tolerating wolves but accepting wolves," she said before the vote. "This was their home before it was ours." Nationwide, bounty hunting and poisoning drove wolves to widespread extermination in the early 1900s. They have rebounded in recent decades, and federal protections have been lifted in the last several years in the Northern Rockies and western Great Lakes. The state commission decided to put off a decision at a meeting in April, wishing first to hear more public comment. The debate came into focus as a lone wolf -- named OR-7 -- began roaming into Northern California from Oregon in 2011. The wolf was the seventh in Oregon to be fitted with a GPS tracking collar. There's recent speculation that OR-7 has taken a mate and may be producing young. State wildlife officials had said they don't support the listing because wolf packs haven't roamed in California for nearly a century and there's no scientific basis to consider them endangered.